The Maduro Flor de Llaneza in the past has been the holy grail of smokes to me. 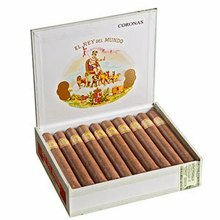 For some odd reason, the last 10 of my Flor de Llaneza burned very fast, and erratic, almost fuse-like, the quality did not seem to be there. 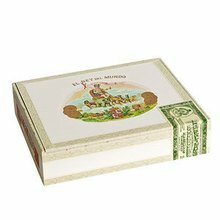 An easy draw to this favorfull cigar along with a fragrant aroma and consistant burn makes this an excellent choice to add to your humidor. Definitely a cigar worth purchasing. Just a good cigar! Hard to go wrong! great smoke!! strong notes of cocoa & coffee with a near perfect burn and excellent draw. feels solid with a gorgeous oily wrapper. What an amazing deal if purchased on sale.Amazing flavors and construction at very Affordable price.I suggest you age them for at least 6 months. 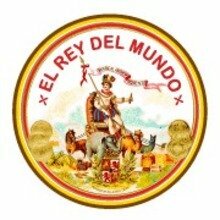 El Rey del Mundo is a great cigar. Flavorful; well made; good draw. A truly premium cigar for less than most. El Rey is just good. Never smoked a bad El Rey. This torpedo is no exception. Med to full body great taste even burn. Doesn't matter if it's the robusto ronco or torpedo. They do not disappoint! Just a very good cigar. Very consistent. The best el Rey I have had. Have only gotten a five pack at a time but a box is in the near future. Purchased five pack. Very nice draw and no fuss. Started to burn unevenly towards end on two though and couldn't correct it. Nice flavor and strength nevertheless.